With 2014 on its way for a few days, I would love to wish you a very happy new year! A good moment also to introduce you to the latest poster art by London based Swedish designers 'One Must dash'. I have admired their posters for a while and I am really happy organizing a giveaway with them today. 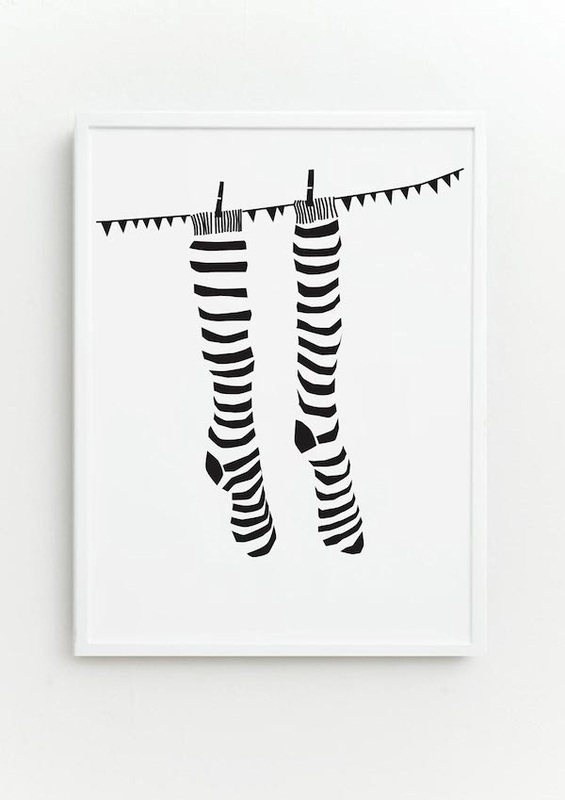 They recently added 4 new prints to their collection, the one above is called 'Knock your socks off' in my favorite black and white. One must dash is well known for their Black and White posters. But with these new prints they also added some color to their collection. For today's giveaway I teamed up with One Must Dash and you can choose one of the 4 prints from the new collection. Make your choice between 'Knock your socks off' or the colourful 'An apple a day' 'Mount treat' or This is a picture of a bird' Surf to the website to have a closer look at them and for more posters and cards.